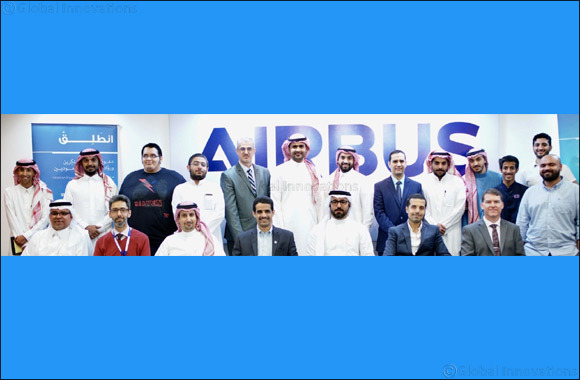 Riyadh, KSA, 1 March, 2018: Airbus announced the successful conclusion of its insightful aviation workshop in Riyadh, part of its ‘Entaliq in KSA’ programme that aims to present aspiring Saudi entrepreneurs with a brief yet rich perspective on innovations in the global aerospace industry. The workshop, held at Airbus offices in Riyadh, was attended by 15 young innovators. During the session a number of aviation experts shared their insights and experiences with the Saudi entrepreneurs. The event was attended by key partners of the ‘Entaliq in KSA’ programme including TAQNIA Aeronautics, Rockwell Collins, Altran, Qotuf, King Abdulaziz City for Science and Technology (KACST) and the Aviation Australia Riyadh College. Experts from leading global companies in the aerospace sector discussed a range of topics and answered questions in an effort to arm the young entrepreneurs with industry knowledge and to assist them in enhancing their business models.